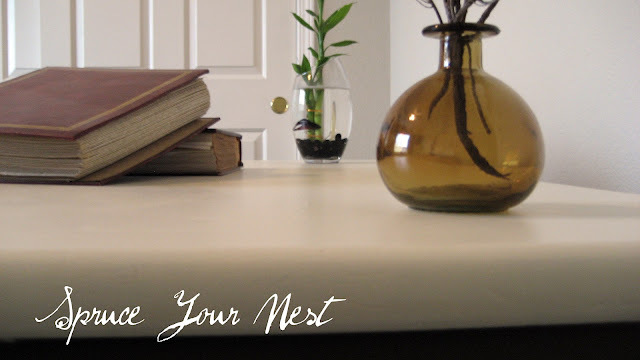 Spruce Your Nest: Desk Makeover Complete! My desk makeover is finally complete! This desk is the first step of our office makeover. 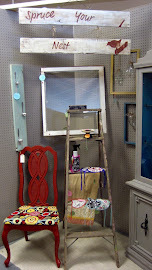 I wanted it to make a statement in the room and I was thrilled because it was my first shot at Annie Sloan Chalk Paint. Painting with the chalk paint was a definite learning curve for me. 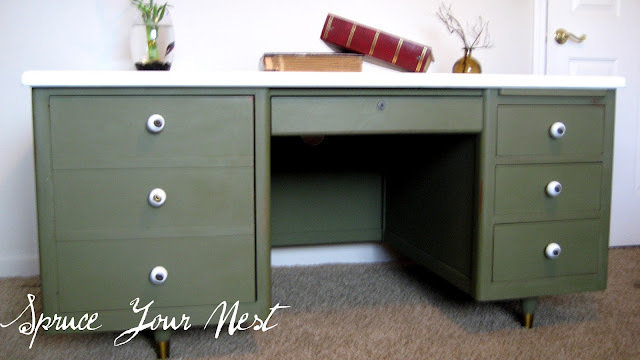 I painted the entire desk Olive and was completely underwhelmed :-( It looked dull and boring and I just couldn't get the look I was going for. I had already painted two coats and after waxing and distressing I was so discouraged. I decided to deviate from the original plan and go to my trusted can of Olympic in Creamy White that I have used for several projects, including my hutch made wall decor and my dresser with ribbon pulls. This was exactly what it needed! 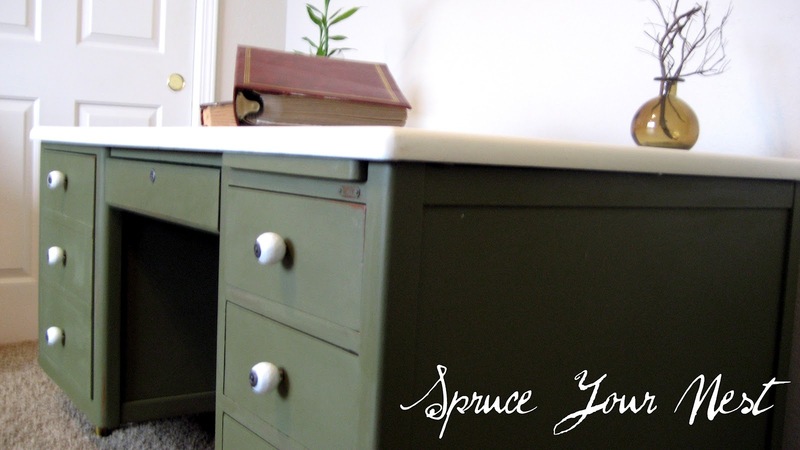 Then I painted the drawers with one more coat of Olive and that did the trick :-) I think this desk was just especially stubborn. I am very pleased with how it turned out and LOVE the chalk paint! 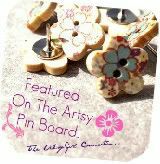 I also had some knobs from Anthropology that I got on clearance that I was itching to use. What do you think? Are you a fan of the 2 tone look or not? Love the 2 tone look. I am planning something similar with a coffee table in our family room - natural on top, cream on the bottom. Thanks for sharing how your project turned out! Beautiful job, Brook! I love the green and the two-tone look. It looks like you put a stone top on it. Annie's a little pricey for me so I'm going to try the recipe that uses unsanded grout powder added to paint. I'll let you know how it works. Several blogs have posted about it and you can Google chalk paint recipes for more if you're interested in a cheaper version. But I have not used or tried it myself yet so no guarantees! LOL! 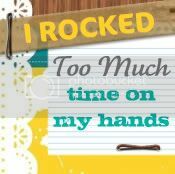 You should be "tickled pink" or green on the job you did! Hurray! I love this color! 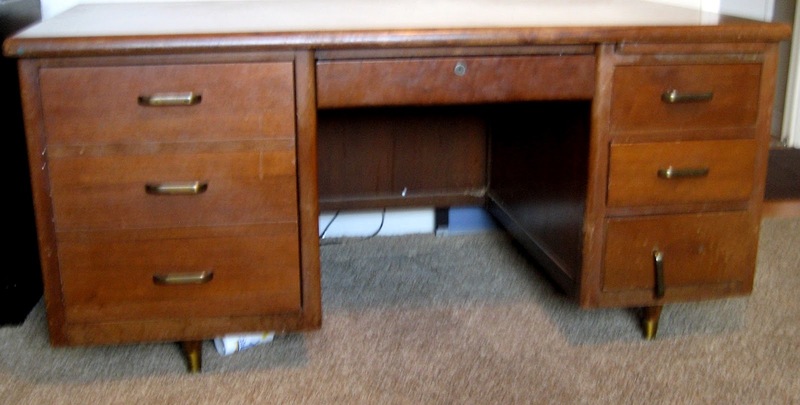 You did a great job breathing new life into your grandfather's old desk. Nice work! I'm hopping by from the 36th ave blog hop and glad I found you. I'm following now on linky. Love the desk! The color looks great and the knobs! Hi Brooke, I love the desk! The two tone is great and you gotta love the green, right!? I'm a new linky follower. Hope you will stop by and have a look at my space too! 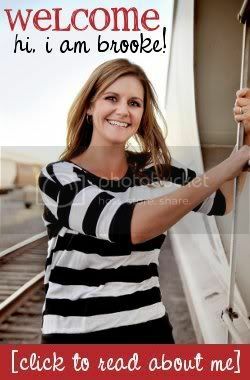 Hello Brooke! The desk looks great. Love the two tone colors. Found your blog via 36th avenue, blog hop. Looking forward to following you along. Wow, you did a GREAT job on this desk! What a difference it made. I know you are very happy with it. It looks great! I love the contrast between the white & the olive - good call on that one! 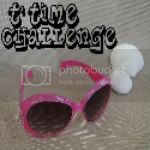 I'm your newest follower on Linky Followers & GFC. I look forward to reading more of your posts in the future. @ Sam I am - I actually tried that exact chalk paint recipe...here is my post on it http://spruceyournest.blogspot.com/2012/01/diy-chalk-paint-review.html. I definitely liked it, but it was grainy and definitely required sanding. I was worried about the price of ASCP as well, but it really does go a long way and not having to sand or prime is fabulous! I love that you made it two toned! It gives it the "wow!" factor the style of the desk needed. 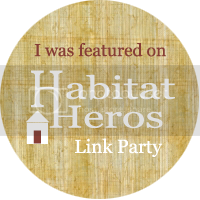 I hope you'll post this on my new link party! The desk makeover looks great! 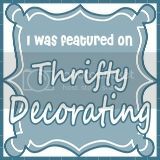 Come by today to check out your feature at NIFTY THRIFTY TUESDAY. Hey I love your desk redo!! I actually just finished one of my own and did two tone as well! How did you like working with chalk paint? Im tempted but nervous to try it! I would love your feedback on my desk if you have any comments! Thanks! I never would of thought that desk could look so good after painting it. I really like the two tones look, so very pretty, and a job well done. Thanks for your creative inspiration at Sunday's Best. Brooke it turned out great! I love the green, it suits the lines of the desk perfectly. I do think the two toned link was perfect for this piece. and wow, what a link list. 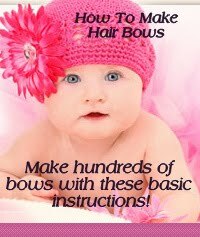 I'm bookmarking this page and taking a look at all those link ups! I love love the desk and the color! I am in-love with all the mid century type furniture.. I love this..the whole thing looks great..even your stuff on top! Looks great- I love the color! Gorgeous makeover!!! I found you at Sundays Best Party, glad I did, you blog is awesome. Hey I love your desk redo!! 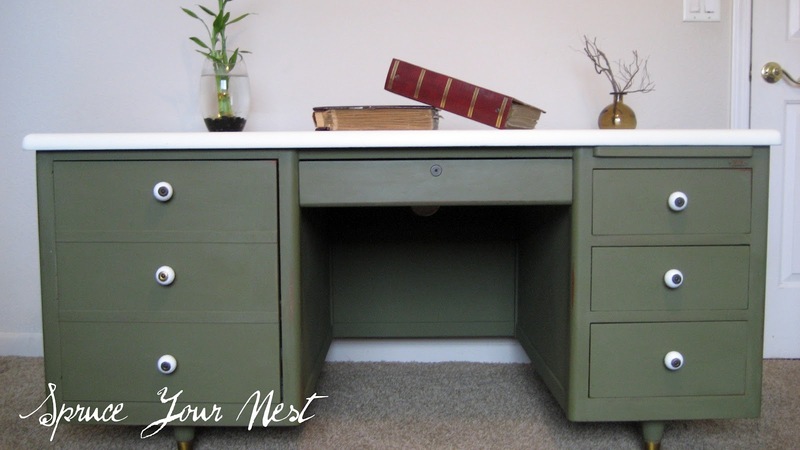 I love the olive chalk paint color. Looks really pretty! 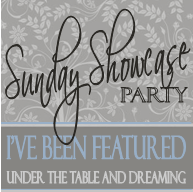 great job, Thanks for sharing your creative inspiration at Sunday's Best Par.tay! Awesome desk! 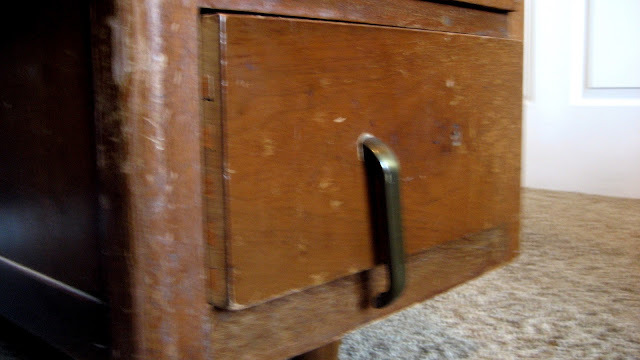 It gives me ideas for my own old wood desk I thought had no hope. I love this desk!! Awesome job! And, yes, I'm a fan of the two toned look. Thanks so much for linking this up last week. I'll be featuring it today! I featured your desk tonight! Crafty, Scrappy, Happy Link Party Favorites!! HUGE Link Party is on! !